NASA is preparing to go to Mars. The Design for Extreme Environments Studio collaborates with NASA on some of the internal architecture for a ground analog of a Mars habitat ( Human Exploration Spacecraft Test-bed for Integration & Advancement = HESTIA) capable of sustaining 4 astronauts for 90 days. Our design focus is on the maintenance and fabrication workstations. Working in teams, we used a human-centered design approach to develop novel designs that address technical as well as human requirements. From a large selection of initial concepts developed in the studio, full-scale mockups were built to validate and elucidate designs. We worked with Robert Howard, Human Factors Engineer and manager of the Habitability Design Center at Johnson Space Center in Houston. To begin with, we need to get our mind ready on Mars so that we can ask questions, understand problems, learn the subject matter that’s important and generally immersive ourselves into the project very quickly. Knowing basic facts about Mars is not enough, we also need to have some knowledge of how human body reacts in space as we are designing for astronauts who might stay on Mars for over 3 months. Their physical condition and mental health should be concerned equally. After understanding the environment of Mars and NASA’s Mars plan, we then move on to learn about the habitat(named HESTIA) NASA is planing to build on Mars. In order to design the repair, maintenance and fabrication workstations (level 1 of HESTIA), we need to know: What’s inside? How many levels are there? What’s each level’s function? What do crew members do inside the HESTIA? What can break? What needs to be repaired and maintained in daily routine? By listing crew functions, we noticed that the use of electronic equipments is almost everywhere in the habitat. So we then focused on our research on electronic maintenance, repair and fabrication. 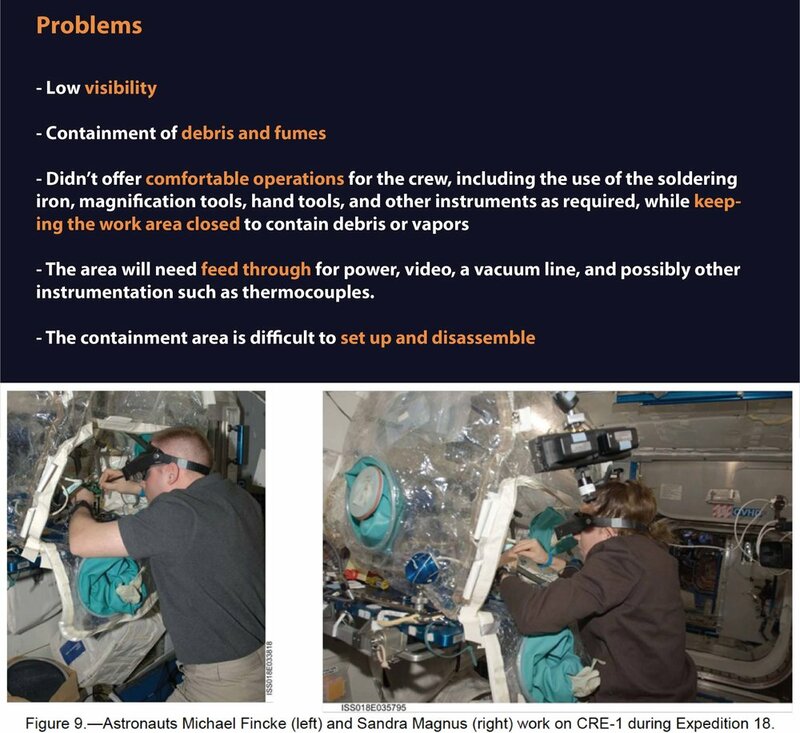 How do astronauts in International Space Station repair electrical system? What is the common process? What tools do they use? What are the difficulties? Based on the above research and our experiments of disassembling and assembling a printer, we then identify what are the primary activities, and created a story board for our NASA astronaut Michael! If there is something wrong with the spacesuit, what does he need to do to get everything fixed. 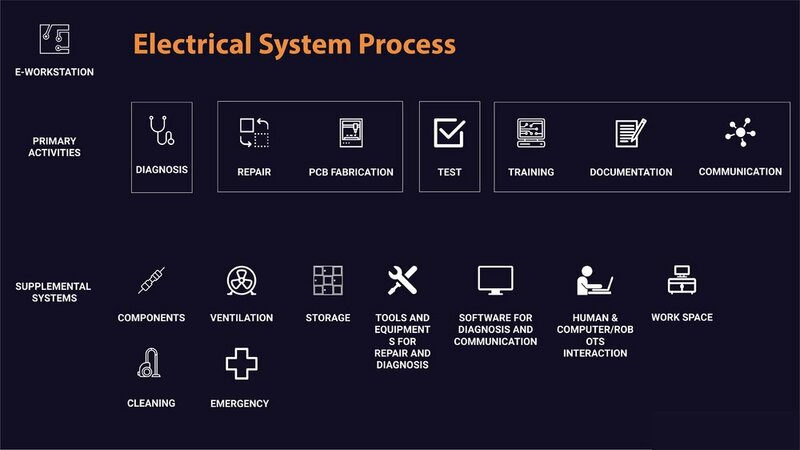 Based on our research and story, we then summarise what are the activities Michael needs to do in the electrical workstation as some of the activities (eg. disassemble faulty parts from spacesuit) should be done in the spacesuit repair workstation. Diagnosis: 1) Diagnose electronics assemblies to identify faulty component(s) with equipment that fits within the mass, volume, and power constraints of spacecraft. 2) Evaluate (e.g., test) and determine that the repaired circuit is safe to return to service. Information: Augment the flight crew with knowledge and skills to diagnose faults and perform repairs without expanding crew size. 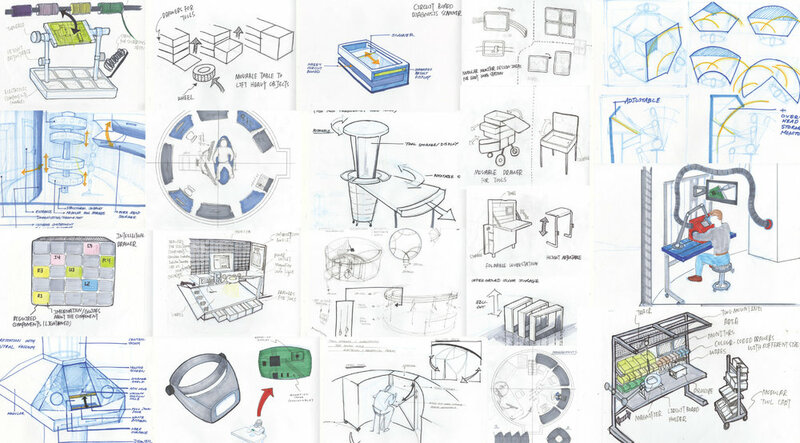 SKETCH | During the ideation stage, a large number of sketches were generated to communicate various idea. 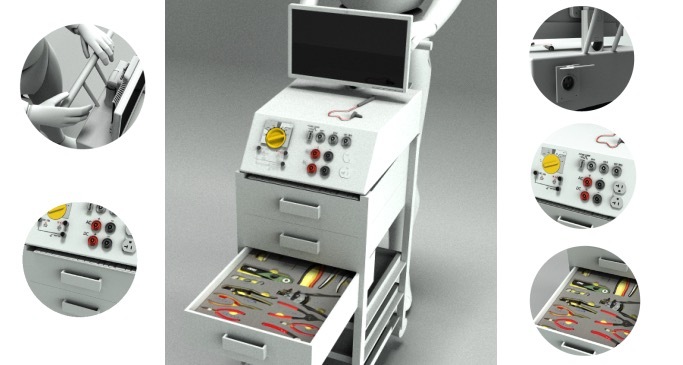 Diagnosis: The diagnosis cart is designed on wheels so it can be moved to other workstations and other unit of the workstation easily when it is needed. Both testing hardwares and softwares are integrated in one unit in order to save space. Information: We designed a duo-monitor information system to cover the span of different functional units. The system is mainly for training tutorials and documentations. Storage: Small tools are organised in a tool box so it can be carried around and used in both assembly unit and soldering unit. The component drawer has small compartments. Each compartment has multiple layers. This is designed for a large number of different components (resistors, capacitors, inductors, etc with different values). Each drawer and each layer is labelled clearly with symbolic tags. Assembly: When disassemble circuit from the faulty part(s), a lot of extra working surface area is needed. All the disassembled components should be organised and tagged clearly so that all components can be resembled after being repaired. We designed a foldable cart so extra surface can be made when needed. The cart has multiple decks underneath for organisation and extending surface areas. Ventilation and filtration: Ventilation hood is mainly used while soldering. It is designed to be foldable so more space can be available when it is not needed. The filtration system is in the above-head space. It can be shared with the fabrication workstation and spacesuit repair workstation and then feed into ECLSS (Environmental Control and Life Support System). Working surfaces: The height of the table surface is decided based on human scale data and multiple iterations and tests. We included a standing table so crew members can have a different working position while using the information system. 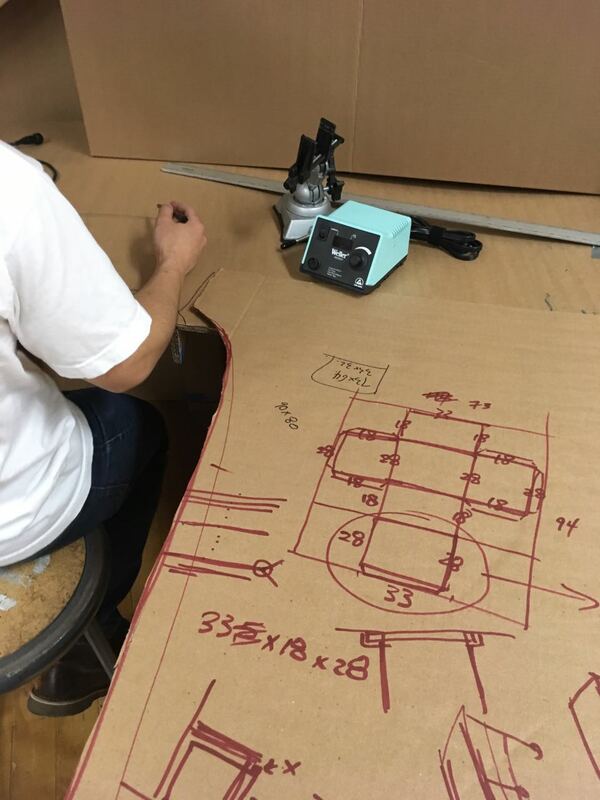 BUILD | We first built the full scale model of HESTIAand the workstation in cardboard. 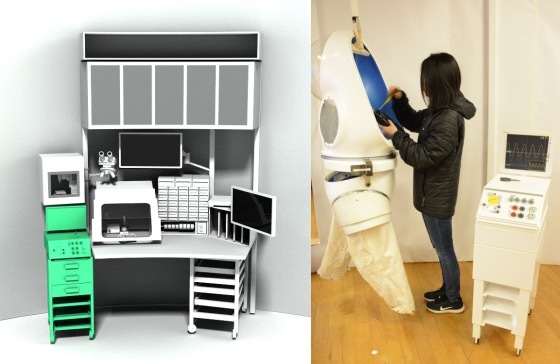 It’s a quick prototype to test the dimension of the workstation and positioning of each functional unit. Our goal is to design an ergonomic workstation which offers smooth workflow for crew members to repair electronics down to the component-level on Mars. Based on all these feedbacks and multiple tests, we finalised our design and re-built the model using foam cores. During the final presentation and critique, we focused on telling stories to demonstrate how to use the electrical repair workstation. Instead of just standing there and explaining every detail, we did a role play. Something is wrong with the spacesuit, so astronaut Luna moves the diagnosis cart with some essential tools to the spacesuit repair workstation. After several testing, she finds out one electrical part is broken. She then disassembles the faulty part, puts it on the cart and brings it towards the electrical repair workstation. Then she needs to disassemble the faulty part to extract the problematic circuit(s). There are two problems with the faulty part. Circuit board A has a connection issue and can be fixed easily. Circuit board B is damaged, and needs to be fabricated again. Luna first repair circuit board A by soldering a wire on it to recover the connection. She takes out the tools and prepares components and equipments needed for the ‘surgery’. Ventilation hood is unfolded to avoid contamination. She uses the stereo-microscope and projects the image on one screen. Repair instructions are also shown on the screen. 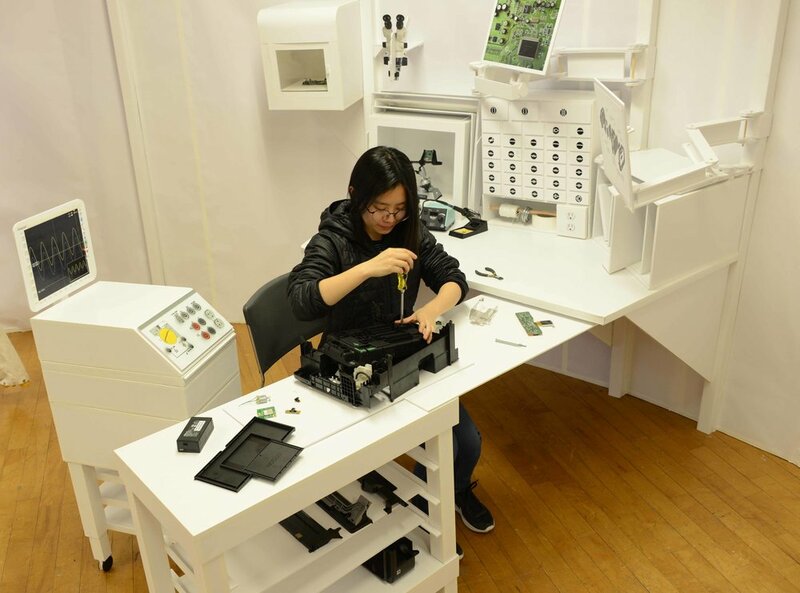 Luna is also able to fabricate circuit board B using the CNC machine and the PCB design software integrated in the information system. 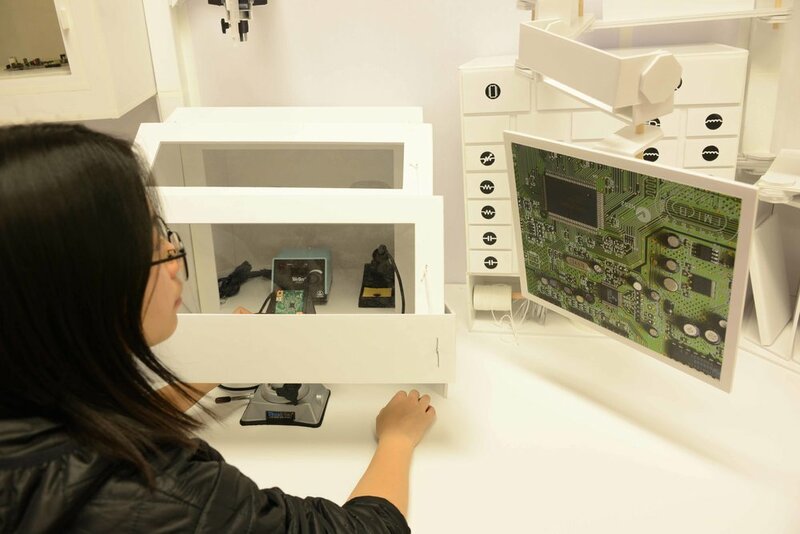 After diagnosing (diagnosis cart) and reassembling the parts (assembly unit and information system), Luna needs to document and evaluate this repair process. There are a lot of technologies developed by NASA. As designers, we need to have a good understanding of these technologies. But we also need to remember that we are designing for human beings, and our design should be user-centric. What I learnt most in this studio is humanisation of technology. Story telling is essential. As engineers and/or designers, we sometime want to show every single detail of our design and concerns. Just as you won’t be able to know how to use a computer by just reading instructions, explanation will make the presentation boring and confusing. By giving up all the explanations, simply showing the audience how to use your product is the most effective way to demonstrate.